In our May 1st, 2006, press release, we have promoted our definition and meaning of 'global politics'. Global politics now exist because what is happening at the United Nations (U.N.) is totally unacceptable. Very powerful military groups and other types of powerful lobbying groups basically 'run' the U.N. Those with the money run the UN. That in itself is an acknowledgment of defeat of the part of an organization such as the U.N. that is supposed to be representing and protecting "the Peoples" rights; universal values of human dignity, freedom, equality and solidarity; and the principles of democracy and the rule of law. We see none of that! We see chaos. We see international politics, governments worried only about their own self-interests, bullying from nations with the most powerful military, and we see an unsustainable future ahead. It has become clear that the U.N. has promoted a culture of violence, waste, mismanagement and corruption which cannot reform itself. Lobbying groups would never allow a thorough reform of the U.N. organizational structure and of its ways of doing things in the world. The world wants an organization dedicated to the welfare of all Peoples and to the protection of the Earth's environment and the global life support systems. Such an organization must not be governed by powerful lobbying groups. We see entire nations making choices based on what is good for themselves, today self-interests, versus what is good for the next generations and all life on the planet. In other words, they make choices between international politics versus global politics. International politics are driven by national interests, self-interests, and powerful lobbying groups, while global politics are about the survival of all of us on the planet. Global politics is about doing what is right for humanity and all life on the planet. 8. the use of trickery to deceive the world and subdue nations. Seeing such a mess, the Global Community had no other choice than to research and develop the Global Constitution, and to enforce Global Law. The Global Community had no other choice than to research and develop a proper system of governance for all of humanity. We want to shut down the UN. We have now replaced it by the Global Community. The power of the Global Community was de-centralized to give each GG a better chance to find the right solutions to global issues. It can act faster and be more effective and efficient in the context of the Global Community, this great, wide, wonderful world made of all these diverse global communities within each Nation.The Global Community becomes thus more fluid and dynamic. A global symbiotical relationship is created between Nations and the Global Community for the good of all groups participating in the relationship and for the good of humanity, all life on Earth. The relationship allows a global equitable and peaceful development. This is the basic concept that is allowing us to group willing Member Nations from different parts of the world. 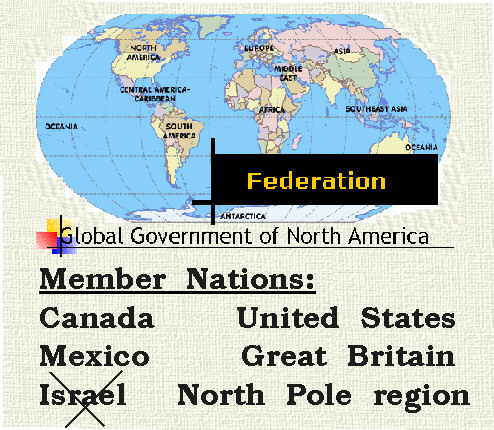 A typical example is the Global Government of North America (GGNA). The Global Community organization will bring proper changes to help humanity and all life on the planet. We will not be able to fix all the problems our ways of life have created but we will have a better chance of survival as a species. Global peace is the end product of our efforts. Once a member state is with the the Global Community, those rights are ours to protect. It is the Global Community’s commitment to the Global Community to make government and global citizens responsible and accountable. The Global Constitution can certified to that commitment. Governance of the Earth will make the rule of arbitrary power--economic (G8 Summit, WTO, FTAA, NAFTA, EU), political (UN), or military (U.S.A. and NATO)-- subjected to the rule of Global Law within the global civil society, the human family. Justice is for everyone and is everywhere, a universal constant. Earth governance does not imply a lost of state sovereignty and territorial integrity. A nation government can exists within the framework of an effective Global Community Earth Government protecting common global values and humanity heritage. Earth governance gives a new meaning to the notions of territoriality, and non-intervention in a state way of life, and it is about protecting the cultural heritage of a state. Diversity of cultural, religion, and ethnic groups is an important aspect of Earth governance. Earth governance is a balance between the rights of states with rights of people, and the interests of nations with the interests of the the Global Community, the human family, the global civil society. Earth governance is about the rights of states to self-determination in the global context of the Global Community rather than the traditional context of a world of separate states. Although the Global Community ensures state governments that it will obey the principle of non-intervention in domestic affairs, it will also stand for the rights and interests of the people within individual states in which the security of people is extensively endangered. A global consensus to that effect will be agreed upon by all Member States. The Global Community has established the criteria of 'a global community of a million people'. There is no need of having a piece of land at all costs. We have shown that a community is not about a piece of land you acquired by force or otherwise. A typical global community may be what a group of people, together, wants it to be. It can be a group of people with the same values. It can be a group of people with the same cultural background, or the same religious background. Or it can be people with different values, cultural background or religious values and beliefs. The people making a global community may be living in many different locations on the planet. With today's communications it is easy to group people in this fashion. It can be a village, or two villages together where people have decided to unite as one global community. The two villages may be found in different parts of the world. It can be a town, a city, or a nation. It can be two or more nations together. A typical community of a million people does not have to be bounded by a geographical or political border. It can be a million people living in many different locations all over the world. The Global Community is thus more fluid and dynamic. We need to let go the archaic ways of seeing a community as the street where we live and contained by a border. It is best for humanity and the increasing world population to see ourselves as people living together or far apart but in constant communication with each other. A community has no boundaries except of those of the heart, mind and Soul. Many conflicts and wars will be avoided by seeing ourselves as people with a heart, a mind and a Soul (a global community), and as part of a community with the same. You should seek forming a Global Government (GG) with nations of similar beliefs and interests. We should seek to de-centralize the Global Community by creating GGs. In the past, the Global Government of North America (GGNA) has given its support to Israel by accepting the State of Israel as a member nation of the GGNA. But now this is no longer the case. Israel is no longer a nation and had to be dropped from the group of nations forming the GGNA. Global Parliament has categorically rejected Israel. Some important members of the Global Community: the global civil society, the Earth Community, the human family, all different ways of expressing the same people. The global civil society is made of people from all aspects of life who have a greater understanding of the problem whatever it may be. The global civil society is the mind, heart and Soul of Humanity, the human family. They maybe NGOs, businesses, agencies, scientists and professionals, religious groups, or other groups. They have a voting right during all meetings of Global Parliament. They are given an important status in the Global Community. And that is the 'raison d'etre' of the House of Advisors in the Global Community. You will be required to send representatives to your House of Advisors. In this way, The Global Community has made lobbying restricted by the Global Constitution and Global Law. The Global Citizens Rights, Responsibility and Accountability Act defines further the conditions and limits of lobbying groups. A very important the Global Community legislation is the Global Citizens Rights, Responsibility and Accountability Act which, after its approval by Global Parliament, will define rights, responsibility and accountability of all global citizens. Each and everyone of us will make decisions, deal with one another, and basically conduct our actions as per the Act. The best way to win the war against terrorism is to live a life with principles and showing by example. We need to educate the coming generations with good principles, being compassionate, and sustainability being some of them. The Preamble and the first few Chapters of the Global Constitution do define and describes in details those principles. All religions are required to conduct positive actions for peace, join the Global Citizens Peace Movement, and re-examine scriptures, precepts, practices, ethical and moral values in light of ecological concerns. The global community is facing a global environmental crisis. It is very important that every person on Earth accept of being part of the process in protecting the global life-support systems. The ecological crisis is as much about saving children as it is about saving other lifeforms on the planet. Our objective is to find statements from all religions that promote the respect, stewardship, protection, ethical and moral responsibility to life and of the environment, the Earth global life-support systems, and statements that promote a responsible earth management. We are also asking for specific statements on environmental conservation such as those expressed by the Islamic religion. The war industry is the "mother of all evils" of our world. It must be shelved. War products and equipment and weapons of mass destruction from all nations must be decommissioned. Join the Global Citizens Peace Movement. Today the war industry is exploiting the issue of terrorism for profit. Everyone knows terrorism cannot be fought by conventional warfare but that would not deter the industry from saying it is the best way to get rid of terrorists. Our governments are now spending tax dollars used for social and environmental programs and services to pay for more war products and equipment. Terrorists have committed the horrible acts of september 11 because the war industry brought terror in their homeland and is continuing to do so today in Afghanistan, in the Middle East, and in Palestine. In the "Letter to the people of the Middle East", the Global Community has asked Muslims not to buy war products and equipment from the West or from any country in the world. The only way to fight evil is by not buying its products. The industry should die eventually, hopefully. But now the war industry is organizating a massive international media campaign to make taxpayers pay for their expenses. More illusions about protecting the humble people from nuclear war heads being sent from one continent to another. The terrorist act of September 11 has shown that if terrorists wanted to use war heads they would not use intercontinental missiles. Throughout the 20th Century, the war industry has created the worse evil humanity has ever encountered: the business of conflicts and wars. It is a business that has made trillions of dollars (American) and will continue to do so. It is the "mother of all evils" created by human beings. It has no moral value, no understanding about Life, no respect for anyone or anything, no law except the ones that it makes for itself, and all its products are meant to kill and destroy. It has sold its products to the enemies for the purpose of making more profit. It has subdued governments all over the world to make them buy its products. It has given trade and way of doing business a bad reputation and, therefore, it is a threat to the establisment of business. Although the war industry has a good public image, it does not really matter who is the buyer as long as he pays good money. The proof of this reality was easily verified by finding out what war products and equipment were being used by Iran, Iraq, Afghanistan, and other Middle East countries. Over 90% of all war products and equipment were made in the USA, Great Britain, Germany, France and Russia. Four out of five of these countries are Permanent Members of the United Nations and that means they have a 100% control on any proposal submitted to the organization. The fifth Permanent Member missing here is China. Shortly after the September 11 event, the UN Security Council has approved war against the people of Afghanistan. To get China to vote YES they gave China a membership in the World Trade Organization(WTO). The Global Community is promoting the settling of disputes between nations through the process of the Earth Court of Justice. On the Scale of Human and Earth Rights wars are the worst criminal offenses.